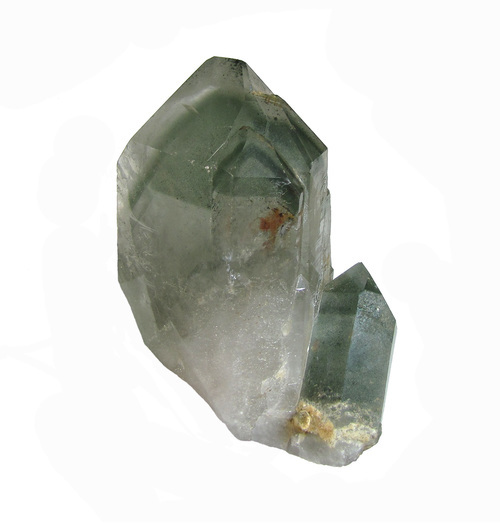 Smoky quartz with greenish-gray phantoms formed by concentrations of “dusty” chlorite crystals showing early positions of faces during growth of the crystal. Collection and photograph Norman King. 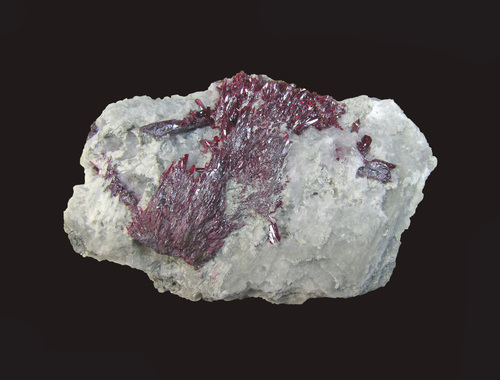 Spays of acicular proustite crystals on calcitic matrix. Individual crystals in upper spray up to 2.8 cm in length. Daughter photo is close-up of the needles. Collection and photograph Norman King. 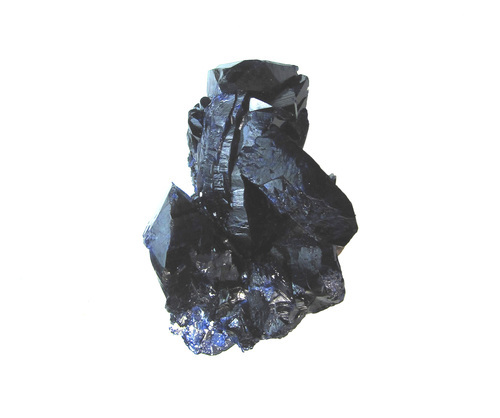 Cluster of azurite crystals up to 3.2 cm in length (exposed portion of diagonal crystal). Collection and photograph Norman King. Detail of chalcedony matrix of the agate in thin section using cross-polarized light. This matrix has no special features in itself, but includes numerous crystals of muscovite, perhaps the variety called illite. 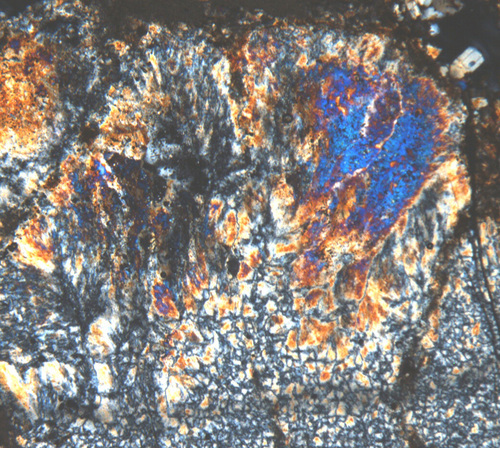 These are made clear in this view by second-order blue interference color, but are obscured somewhat by being associated with darker “dirty” areas that are relatively rich in material other than microcrystalline quartz. Most in-depth published discussions about chalcedony I have seen mention that fine phyllosilicates (often referred to as “clays”) are likely mixed with chalcedony as accessory minerals, but I have not seen any photomicrographs published to illustrate that claim. So, here is the proof! Electron micrography might also reveal presence of fine micas, but can only show form (habit) of minerals. In this field of view (2.1 mm) the muscovite crystals range from 0.005 to 0.06 mm (5 to 60 microns). The largest example is near middle of slide at far right. Collection, thin section, and photomicrograph by Norman King. Siccar Point is arguably the single most important outcrop in the history of geology, but the site and its significance is not well-known to locals (I found out! ), and is not well marked on location. 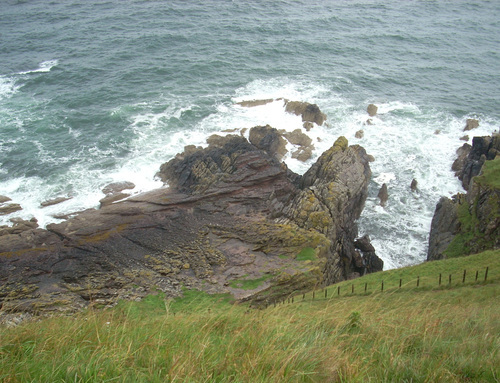 Nevertheless, this is where James Hutton (1726-1797) and companions including geologist Sir James Hall and mathematician John Playfair discovered a striking exposure of the “Great Unconformity,” a feature that convinced Hutton that Earth history included great cycles of deposition of sediments in the sea in the same manner as we can see them being deposited today, followed by lithification and uplift of the resulting rocks, which were then eroded, and covered again by the sea, when the sequence was repeated–again and again. Hutton’s work has been credited with marking the beginning of uniformitarianism and making geology a true observational science. Thin section in cross-polarized light showing a tiny segment (FOV = 5.4 mm) of crazy lace agate from the classic locality in Chihuahua, Mexico. At this site the botryoidal chalcedonic layering broadened to go around a cluster of spherulites that are not present within thinner layering on either side. The scattered opaque smudges are either iron or manganese oxides, and the straight objects at upper left may be rutile crystals that came loose from their “roots.” Each spherulite in the cluster exhibits a Maltese cross with blue-white background. Collectively, these suggest a fireworks display performed to celebrate New Year’s Day. Thin section, photomicrograph, and imagination by Norman King. Happy New Year! Thin section of chalcedony using cross-polarized light. 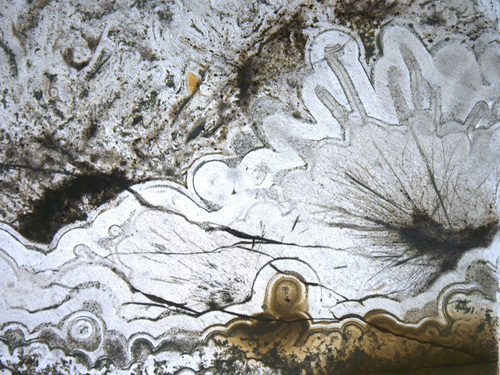 The lower part is dominated by basic chalcedony spherulites, each composed of four subdivisions divided by a dark Maltese cross, often referred to as a pseudo-interference figure. Where crowded together, however, the spherulites are more rectangular than circular. The arms of the Maltese cross (which is known by several other names, including Norman cross) are produced by extinction directions in the petrographic microscope, and all of them are always oriented “north-south” and “east-west” regardless of the position of the microscope stage. Chalcedony in spherulites ranges in color from white to gray, with yellow to orange in the thicker portions. Some of the spherulites higher in this view have become greatly extended upward above the east-west arms of the cross, developing a plumose habit mostly above that level. This habit is produced by extensive Brazil twinning on a "micro" scale (see Heaney, 1993, Fig. 3). The feather-like plumes are more colorful upward, showing first-order yellow, orange, and red, and then second-order violet and blue. Some of the plumes reach completely across the remaining portion of the chalcedony field. Based upon the appearance of this habit in thin section, I call it (facetiously) “hair-on-fire chalcedony.” Daughter photos show other examples in the same specimen to show the range of appearances. Thin sections made by Norman King from material collected by Daniel Bennett and now in King’s collection. Ref. : Heaney, P. J., (1993) A proposed mechanism for the growth of chalcedony. Contributions to Mineralogy and Petrography. 115: 66-74. We need to know what is eating our rocks and minerals! 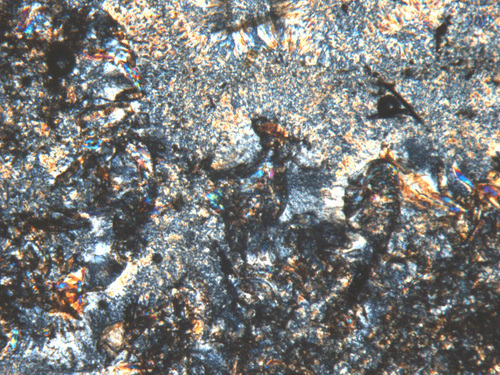 This thin section in cross-polarized light shows endolithic fungi or flora (red algae) extending a few millimeters into chalcedony from an opaque rocky substrate at bottom. 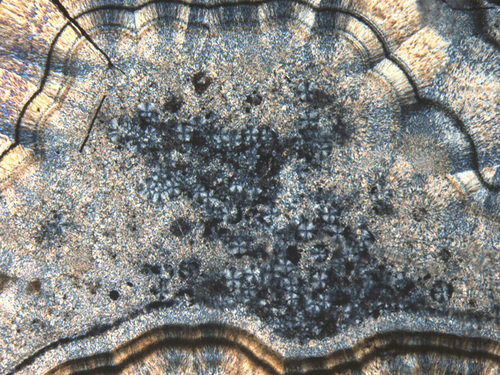 The tubular filaments and chambers are undoubtedly connected by filaments outside the plane of the thin section. In this case, note that chalcedony formed around the biologic structures. My interpretation is that the rock was opaline when initially bored by the endoliths, and then the opal was replaced by spherulitic (botryoidal) chalcedony. Biologists and engineers are very interested in this kind of “weathering” of man-made and natural structures in both terrestrial and marine environments. See daughter photos for overview of the hand specimen and thin section, plus enlarged views showing more details. Collection, thin section, and photographs by Norman King. Thin section in plane polarized light showing needles of rutile within crazy lace agate from the classic locality. Note that agate coats the rutile needles, forming projections much thicker than the needles themselves. Identification of rutile based upon habit and association. 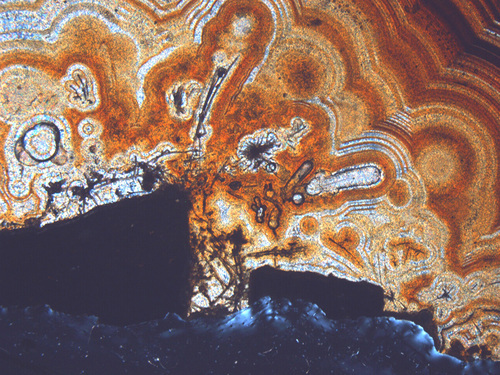 Collection, thin section, and photomicrograph by Norman King.